This feature, written by Serge Gauthier and Pedro Rosa-Neto, both from McGill Center for Studies in Aging, Montreal, Canada, is an overview of drug development in early and late onset Alzheimer’s disease (AD), defined by age 65 at onset of symptoms. There is some overlap but also significant differences in these populations (Figure 1). 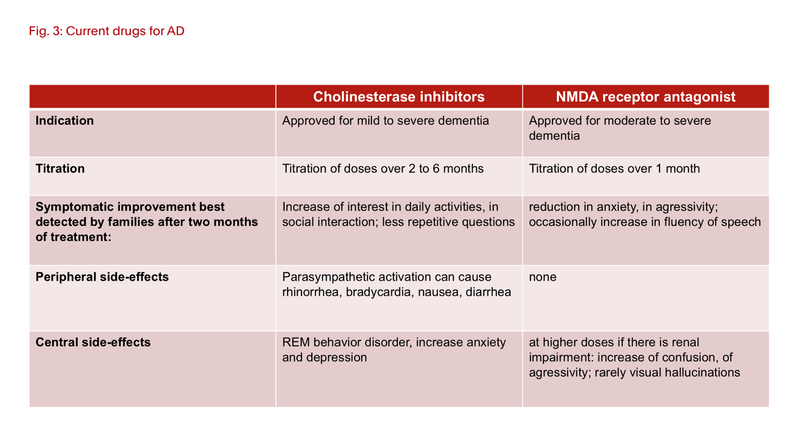 There are two classes of drugs currently approved by regulatory agencies worldwide for the symptomatic treatment of dementia due to AD: cholinesterase inhibitors (CIs) and a NMDA-receptor antagonist. 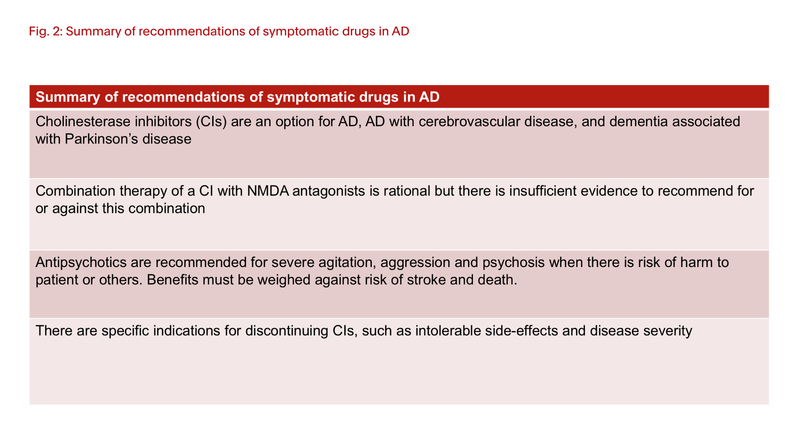 Guidelines for best use of these drugs have been published based on best available evidence (for instance those of the Canadian Consensus Conference on the Diagnosis and Treatment of Dementia, Gauthier et al 2012, Figure 2). These drugs have proven to be relatively safe despite their use in older patients with co-morbidities such as heart disease (Figure 3). The lack of recent (it has been over 10 years) approval by regulatory agencies for new drugs against AD does not reflect a lack of research activities. A number of different reasons exist for the absence of positive clinical trials in treating AD (Gauthier et al, 2016), including high screen failure rates due to (often) requiring amyloid positivity in inclusion criteria. Other challenges include the heterogeneity of late onset dementias, with co-existing amyloid, tau, vascular and Lewy body pathologies. Further, control groups in clinical trials on standard treatments are also relatively stable, and thus require longer studies. Encouragingly, however, a number of putative symptomatic and disease-modifying drugs have been tested and many others are currently under study (Cummings et al 2016). These diagnostic criteria were intended to accelerate research in AD throughout its stages, but there was a risk of making a clinical use of these criteria without adequate validation of their predictive value. This was particularly true with amyloid PET imaging, which became available commercially outside of academic centers where ethical supervision and the use of carefully designed disclosure protocols are available. Fortunately, good collaborations between the FDA and companies distributing the amyloid ligands have reduced the risk of catastrophic reactions from misinterpreting a “positive amyloid scan” as a definitive diagnosis of AD (Grill et al, 2017). Furthermore, the use of amyloid PET imaging (or CSF β42 measurements) is now a standard practice in the enrolment of volunteers in many AD studies, and although there is generally no disclosure of individual results, it can be done if appropriate disclosure protocols are in place. A number of biomarkers have been established for AD, including pathophysiological markers (amyloid PET, CSF β42), neurodenerative markers (glucose PET, tau PET, MRI, CSF tau), and others that may be potential markers of disease activity (including inflammatory CSF and PET markers). The AD field has benefited from large scale observational studies such as the Alzheimer Disease Neuroimaging Initiative (ADNI; Weiner et al, 2017) with an observational study in subjects with no cognitive decline, mild cognitive impairment or early dementia due to AD. 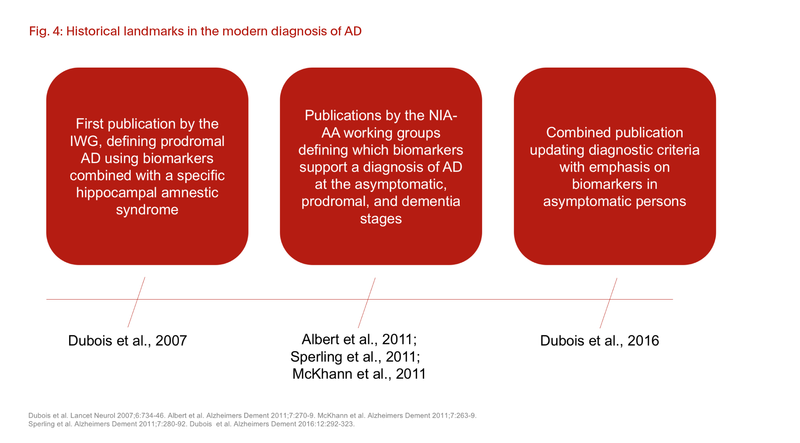 ADNI’s data sharing policy to investigators around the world has led to important findings such as the underlying pathology of AD being present long before dementia has clinically manifested. An example of the impact of ADNI is the demonstration of a synergistic effect of β-42 and tau pathologies in asymptomatic at-risk persons as well as persons with Mild Cognitive Impairment (Pascoal et al, 2017a;b). These biomarkers may lead to preventive treatments that are personalized, e.g. treat the pathological factors most active for that individual at the current stage of his disease. The best example would be neuro-inflammation, which is silent but very much present in the brain of individuals in the asymptomatic stage of AD, now detectable by specific PET ligands and by CSF examination, and is potentially treatable with non-steroidal, anti-inflammatory drugs. 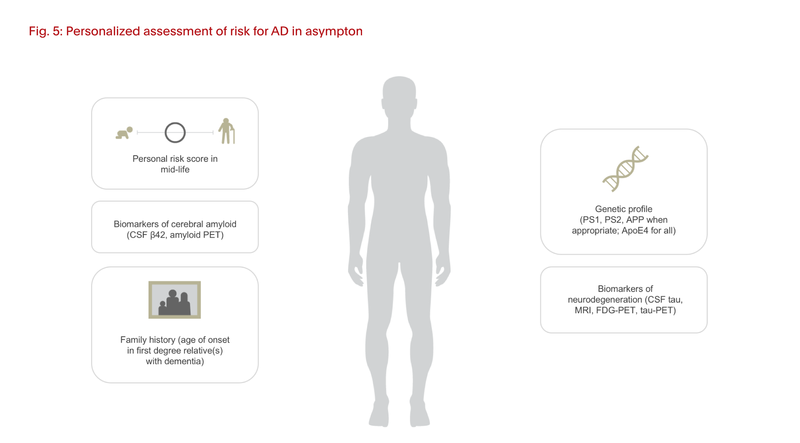 Genetic factors in AD include the rare autosomal dominant mutations (PS1, PS2, APP) causing early onset AD, and the common (approximately 15% of population) apolipoprotein E4 genotype which increases the risk for late onset AD around age 70. Homozygous (e4/e4) persons have an even higher risk by age 65, leading to clinical trials specific to that population. Since the prevalence of ApoE-e4/e4 is relatively rare (3% of the general population; 15% of patients with AD), novel recruitment strategies are under way, such as registries where volunteers can mail a cheek-swab and agree in principle to be contacted if there is a preventive study appropriate with their risk status. Careful ethical supervision of these registries, data sharing, disclosure of genetic results is supervised by Ethical, Legal, Social Impact (ELSI) committees such as the one supported by the Canadian Institutes for Heath Research through the Canadian Consortium on Neurodegeneration in Aging. For persons carrying PS1, PS2 or APP mutations causing early onset AD, specific research programs are underway, such as the Dominantly Inherited Alzheimer Network (DIAN) led by Ronald Bateman (Bateman et al, 2012) and the Columbia Registry (Rios-Romenets et al, 2016), both leading to randomized clinical trials with anti-amyloid drugs. Finally, the special case of patients with Down’s syndrome (trisomy 21) should be mentioned. Since the amyloid precursor protein is located on chromosome 21 resulting in excessive amyloid production, Down’s syndrome is associated with symptomatic dementia which often occurs earlier in life (by the early to mid-50s) (Castro et al, 2017). There are studies under way with this population using anti-amyloid active immunization. It is thus possible to imagine an individual assessment of risk for AD in later life and administer treatments proportional to their risk (Figure 5). Protective factors have been established for late onset AD, where advancing age is clearly the most important risk factor (Figure 6). 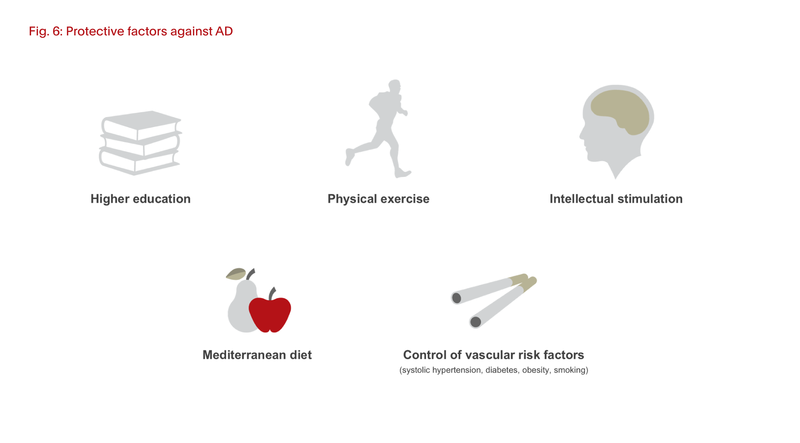 Primary prevention of AD is the most promising strategy from a public health perspective (Berr, 2016), and national plans against dementia in many countries are encouraging higher education and healthier lifestyles. The decrease in prevalence of dementia in the United States between 2000 and 2012 is attributed primarily to an increase in educational attainment (Langa et al, 2016), and other countries are reporting reductions attributed to stricter control of vascular risk factors in mid-life (Prince et al, 2016). Although no new drug therapies for AD have been introduced to the market in the past 10 years and no curative drugs against AD are projected on the horizon, there has been significant progress in the biological definition of AD, allowing for preventive studies in asymptomatic at-risk or minimally symptomatic stages of AD. The repurposing of older drugs acting on inflammation or modifying the effects of deficient cholesterol transport may be more successful for the general population at-risk than the anti-amyloid drugs which may be only useful in early onset AD. Given extensive evidence highlighting the efficacy of protective factors against the development of dementia, national plans against dementia should be established or expanded worldwide (Shah et al, 2016). Health economics modeling of potential savings from such interventions are already being drafted (Gustavsson et al, 2017). Albert et al. The diagnosis of mild cognitive impairment due to Alzheimer’s disease: Recommendations from the National Institute on Aging-Alzheimer’s Association workgroups on diagnostic guidelines for Alzheimer’s disease. Alzheimers Dement 2011;7:270-9. Bateman et al. Clinical and biomarker changes in dominantly inherited Alzheimer’s disease. N Engl J Med 2012;367:795-804. Berr C. Primary prevention of dementia: an epidemiological point of view. J Prev Alz Dis 2016;3:160-3. Castro P, Zaman S, Holland A. Alzheimer’s disease in people with Down’s syndrome: the prospects for and the challenges of developing preventative treatments. J Neurol 2017;264(4):804-13. Cummings et al. Drug development in Alzheimer’s disease: the path to 2025. Alzheimers Res Ther 2016;8:39. DOI 10.1186/s13195-016-0207-9. Dolgin E. How to defeat dementia. Nature 2016;539:156-8. Dubois et al. Research criteria for the diagnosis of Alzheimer’s disease: revisiting of the NINCDS-ADRDA criteria. Lancet Neurol 2007;6:734-46. Dubois et al. 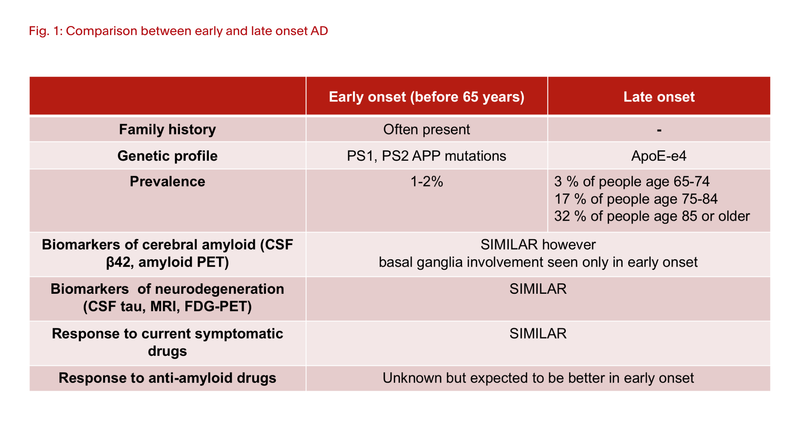 Preclinical Alzheimer’s disease: definition, natural history, and diagnostic criteria. Alzheimers Dement 2016:12:292-323. Gauthier et al. Recommendations of the 4th Canadian Consensus Conference on the Diagnosis and Treatment of Dementia (CCCDTD4). Can Geriatr J 2012;15(4):120-6. Gauthier et al. Why has therapy development for dementia failed in the last two decades? Alzheimers Dement 2016;12:60-4. Grill et al. Patient and caregiver reactions to clinical amyloid imaging. Alzheimers Dement 2017;Feb4 [Epub ahead of print]. http://dx.doi.org/10.1016/j.jalz.2017.01.001. Gustavsson et al. Current issues and future research priorities for health economic modelling across the full continuum of Alzheimer’s disease. Alzheimers Dement 2017;13(3):312-32. http://dx.doi.org/10.1016/j.jalz.2016.12.005. Langa KM, Larson EB, Crimmins EM, Faul JD, Levine DA, Kabato MU, et al. A comparison of the prevalence of dementia in the United States in 2000 and 2012. JAMA Intern Med 2017;177(1):51-8. doi:10.1001/jamainternmed.2016.6807. McKhann et al The diagnosis of dementia due to Alzheimer’s disease: Recommendations from the National Institute on Aging-Alzheimer’s Association workgroups on diagnostic guidelines for Alzheimer’s disease. Alzheimers Dement 2011;7:263-9. Pascoal et al. Amyloid-ß and hyperphosphorylated tau synergy drives metabolic decline in preclinical Alzheimer’s disease. Mol Psychiatry 2017a;22(2):306-11. doi:10.1038/mp.2016.37. Pascoal et al. Synergistic interaction between amyloid and tau predicts the progression to dementia. Alzheimers Dement 2017b;13(6):644-53; http://dx.doi.org/10.1016/j.jalz.2016.11.005. Prince et al. Recent global trends in the prevalence and incidence of dementia, and survival with dementia. Alzheimers Res Ther 2016;8:23. DOI 10.1186/s13195-016-0188-8. Rios-Romenets S et al. The Columbian Alzheimer’s Prevention (API) Registry. Alzheimers Dement 2016. http://dx.doi.org/10.1016/j.jalz.2016.09.010. Shah et al. Research priorities to reduce the global burden of dementia by 2025. Lancet Neurology 2016;15:1285-94. Sperling et al. Toward defining the preclinical stages of Alzheimer’s disease: Recommendations from the National Institute on Aging-Alzheimer’s Association workgroups on diagnostic guidelines for Alzheimer’s disease. Alzheimers Dement 2011;7:280-92. Sperling et al. The A4 Study: stopping AD before symptoms begin? Sci Transl Med 2014;6:228fs13. Weiner et al. The Alzheimer’s Disease Neuroimaging Initiative 3: continued innovation for clinical trial improvement. Alzheimers Dement 2017;13(5):561-71. http://dx.doi.org/10.1016/jalz.2016.10.006.